No matter how much we rock them, seed, blanket or pave them, eventually all ditches need to be maintained. Routine maintenance of ditching creates soil disturbance and bare, erodible soils. These soil needs to be stabilized as soon as possible to reduce the likelihood of downstream sedimentation. Hydroseeding (aka: hydraulic mulch seeding or hydro-mulching) is a planting process that uses a combination of water, seed, mulch and fertilizer. The material is combined into slurry with a consistency of soggy oatmeal. The slurry is sprayed over prepared ground and the process is often used in large areas with steep or uneven terrain. 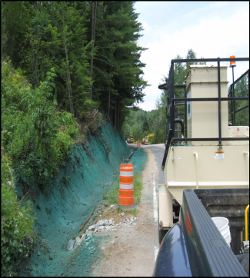 In these situations hydroseeding is very efficient and effective at covering the project site. Hydromulches vary from paper to woodchips and may even come with a tackifying or bonding agent to secure it to steep and uneven surfaces. Some mulches are dyed green to assist the applicator in identifying adequate coverage. 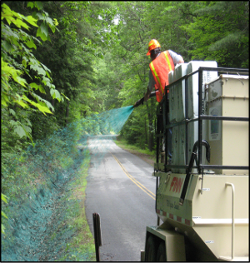 Hydroseeding is a highlight efficient and cost effective means for establishing vegetation in ditches to prevent erosion. Hydroseeding should only be applied during frost free times of the year. If a germinating seed is hit with frost it will be killed, and no roots will be established! A traditional alternative to hydroseeding is the use of straw mulch. Straw mulch acts as a protective layer of a material that is spread on top of the soil. The use of a Power Mulcher expedites the process and uses a machine to chop or shred bales of straw and blow the material over barren ground. By applying a thick layer of straw, which is usually rated by percent coverage in BMP guides, the ground can be sufficiently protected. Mulching offers other benefits including; compaction reduction, conserves moisture, reduces watering, maintains an even soil temperature and prevents weed growth. For more information on either of these activities, contact CWICNY or your local Soil and Water Conservation District.